“You never know!” but yea, I do. Okay, once again I will preface this post by identifying myself as an atheist. And I will be talking about a problem I’ve been having with some truly well-meaning religious people. Since I was diagnosed with breast cancer in 2009, people have told me that they “know I don’t believe, but..” they’ve prayed for me because “you never know?! right?” Uh, right. I’ve never been a fan of Pascal’s Wager, the proposition that even if it makes no sense and you don’t believe in any god, you should make yourself believe, because, hey- what if you’re wrong? When someone tells me that they prayed for me, even though they know I don’t believe, what they are saying is “My belief is right and you are wrong, but I like you, so I’m going to make myself feel like I’m helping you by thinking about you.” I realize that their intentions are good, even when they are essentially doing nothing. Prayers on the behalf of others are uttered to a Divine Creator who presumably has the power to heal and comfort the mind and body. Mere humans can’t do this to the extent that the Almighty can, so why not bring out the heavy artillery if you really care about a friend? While one might feel a bit of comfort from the “thoughts” of a friend, why would anyone in real trouble settle for the relatively impotent “thoughts” of a fellow human being if they could receive a blessing that originates from the petition of a person kneeling in prayer? What most religious people don’t understand is that while it is kind and well-meaning, to pray for someone who does not believe is the same as the “impotent ‘thoughts'” of a fellow human. I appreciate the love being expressed by the thoughts people send my way, but I’d rather you wrote me a letter, or invited me out for coffee or donated to fight MBC or even volunteered for your local cancer society with me in mind. Having cancer for a year and MBC for two I’ve learned that the thoughts of my fellow human can be freaking amazing, and the potential for kindness is unlimited. But don’t pray for me ’cause “you never know,” since if there were a controlling deity, it gave me the cancer in the first place. If I hurt of offended anyone, it wasn’t intentional. I know we atheists have to walk a fine line in expressing our opinions when there are believers amongst our friends. To make up for any insult or hurt feelings, here’s a corgi puppy. They always make me feel better. I’m an atheist who is not so concerned about offending folk, but I understand what you mean. Your story is powerful, all that pain and suffering and still no need for a god. I can’t really take you out for a cup of coffee, but I will donate and hope that your life is as happy as that puppy looks. Thank you! On occasion my life is as happy as the puppy, especially when I get a comment like yours! I don’t know many atheists so it’s good for me to hear your point of view. I don’t want to offend anyone by doing something they don’t want. However, your blog has opend up a place for me to comment. God didn’t give you cancer. There’s a lot of ugliness in the world that is there because mankind made decisions and God gives us the freedom to choose. He won’t force Himself on you. You’ve made your choice to live your life your way. But just because you are an atheist, doesn’t mean I can’t make my own choices. If I choose to pray for you, why be offended? It’s me using my time, my way. It’s more of a peeve than a matter of offense. I know that the loving people who pray for me have only the best of intentions. It’s just that when they start with “I know you don’t believe, but…” they are asserting a correctness in their faith in spite of the fact that I don’t share it. The family member I mentioned in my post flat-out told my husband that our “thoughts” were not welcome because to a believer, they are a waste of time and worse then pointless. I have never said this to anyone. But yesterday my sister pushed me over the edge with “you never know!” which led to my post. I’m sorry about the closed-mindedness that you experienced. I would love to know more and will follow your blog. Julie, I would agree with what you say completely if I knew that you kept it to yourself and did not bother people with telling them that you are praying for them. At that point you are using their time too and pretending that your efforts will do them some good. The thought is not a problem but when your gesture is as useful to the person as saying you’ll think of them when you’re doing dirty laundry, it is of no help and difficult to think of as a compliment or empathetic sentiment. The idea that there is ugliness in the world because of decisions by mankind confers a great deal that there is zero credible evidence for. The idea that the sins of the father are bequeathed to the children is vile. Original sin and born as a sinner are ideas that condemn everyone no matter how good they are. Offering to pray for them because you think they are damned and need your help is … well, it’s as useful as saying you’ll think of them while you’re cleaning the toilet. You’ll find, I’m certain, that if you send well wishes and a smile without bringing your theological misgivings into the situation will be much better received. Nobody needs your theology to appreciate that you are being thoughtful. 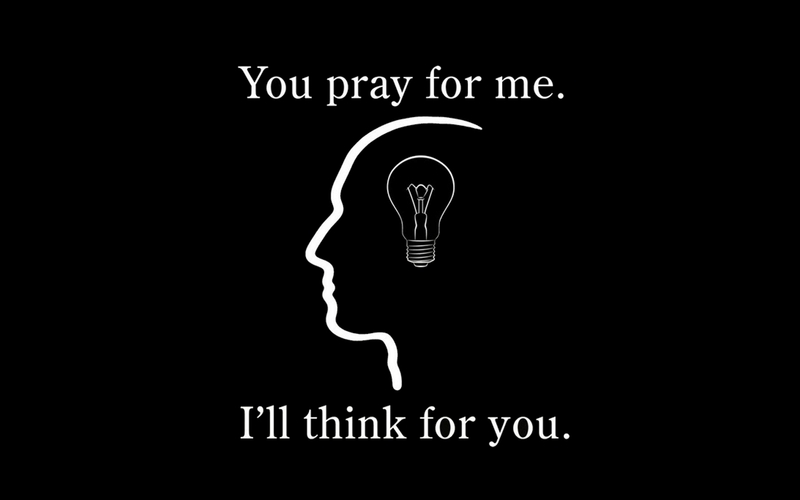 Saying you’ll pray for someone is proselytizing, no matter what you think it is. The very notion that I have to listen to your theology to receive your well wishes is, in fact, insulting. While you’re pretending to be thinking of others, perhaps you could actually do that and consider their feelings over yours in as much as they don’t need your preaching to understand that you wish them well and proselytizing with your well wishes demeans the well wishes 100% for those not of your faith. You can well carry on thinking it’s your right to use your time as you wish, but it is also the right of others to think of you as a proselytizing nuisance who supports the most vile parts of our society, no matter whether it is passive or active support. Jerry Falwell, Benny Hinn, and their ilk pray for people too. The non-theist will almost always see both prayers in the same light. Julie, I looked at your blog and am wondering what brought you to mine. You aren’t a cancer survivor or patient, nor are you an atheist or one of my friends. Your blog is entirely evangelical and focused on your religion. Unless you intentionally seek out atheist sites to proselytize, (and my post didn’t really give you an opening to comment) why are you here? While you said that your god dosen’t force itself on people, people like you certainly do. I never got the point of prayer. Surely if you’re a deserving case, God will do it anyway? Why do you need to build up credits? I’m an Atheist but that doesn’t stop my Mum praying for me as though exam results were based on the amount of prayers said instead of study done. If only it was that easy. I believe that I usually send people positive thoughts or warmest hugs or something somewhat hippie-generic in order to not offend. I do believe and I do pray but I feel that what I do in the privacy of my heart and mind is my business. In some strange way, I do what I feel a need to do because it is necessary to process and store information for me. Is it a completely selfish act? No, my belief means something to me and in the course of my day, I have done something for someone else because I believe in what I do. It is not always necessary to tell them so unless that knowledge would add to their experience. Unfortunately, I believe that “sending prayers” is often a gratuitous statement made out of obligation rather than the saying of actual prayers of any kind on another’s behalf. And in those cases, not only is it unwanted but thoughtless and futile for everyone concerned. Furthermore, I concur that “you never know” is not a rational reason to pray. Either one believes or they do not. “You never know” is a ridiculous statement that should, in fact, induce ire from both atheist and non-atheist. I do think of you often as I feel that we have become friends. What I do wish is that we could have coffee or take a ballet class or rummage through a stationary shop together. I appreciate your ability to reveal your thoughts and feelings. You make me consider my thoughts and my words all the more carefully. And I love the puppy too. I was really worried about writing this post because non-believers have to walk on eggshells to keep from offending believers because so many of my dear friends (including you darling) believe, but my sister’s “you never know” just stuck in my craw. I think about you all the time too, and I’m so proud that you got through your defense with flying colors! I appreciate that you are careful with your words, you are a caring and considerate person. It’s so important that we learn to truly and deeply listen to each other as human beings. And I think that its important that you express what you feel and how other’s words affect you! Even if occasionally someone is offended. I can tell you that I was in no way offended by your post. I have a great respect for you – what you believe and how you think. Let me also say that when I send you love and positive thoughts that is exactly what I do! Thank you so much, hon. This PhD thing is an exercise in insanity. Having you in my corner means the world to me! I just spent some time reading your blog. I love it. The rabbit made me laugh! I needed a good laugh today! I love your choices in reading material and I love the orange backpack with wheels!